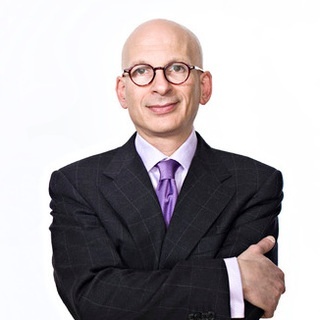 Peter Aprile and Natalie Worsfold interview Seth Godin. Yes, Seth Godin!!!! S-E-T-H-G-O-D-I-N!!!!!!! We believe that outside voices are key to the legal industry evolution. And, as long time fans (...well...Stans to be more accurate), we believe Seth’s insight adds considerable value to the conversation. Seth talks to us about the “lawyer narrative”, real v. perceived fear, making art, and the future of legal industry in the connection economy. Seth Godin: [0:08] I first need to state my credentials. I lived for one year in Mercer Hall, the dorm of the NYU law school. I am married to a woman who for 25 years was a workaholic lawyer. My grandfather was the dean of the bankruptcy Lawyers in New York City. My other grandfather taught Business Law in college. [0:27] My parents, thankfully, were not lawyers, nor are my siblings, but there are plenty of lawyers if you cut deep enough. And, one of my very first projects was a book called “The Select Guide to Law Firms”. So, I have spent more time talking to lawyers than most civilians. [0:48] Hi and welcome to “Building NewLaw”. It’s a podcast hosted by me, Peter Aprile and my colleague, Natalie Worsfold. In each episode, we interview lawyers, legal technologists, and other like‑minded people at the forefront of NewLaw. [1:00] We hope that the podcast connects the NewLaw community and helps us all learn more about the approaches that are changing the way that we practice law. Enjoy the show. Sponsor: [1:12] The Building NewLaw podcast is supported by Counter Tax Lawyers, a new type of tax controversy and litigation law firm. To learn more about Counter, go to countertax.ca. 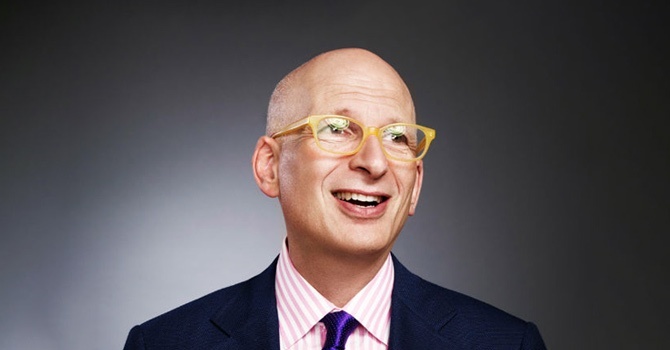 Peter: [1:29] I’m really excited because today Seth Godin is on the podcast. Seth is not easy to define. He’s a marketer, inspirational speaker, and somebody who’s out there encouraging all of us to go out and create a ruckus. Natalie Worsfold: [1:43] Seth is the author of 18 books and writes about the post‑industrial revolution, the connection economy, the way ideas are spread, treating people with respect, and most of all, changing everything. His daily blog is one of the most popular in the world. [1:57] Seth is an impresario, a person who organizes projects. From Yoyodyne, which Yahoo bought for $30 million back in 1998. “Change This” is another project and “Squidoo”, which became one of the most visited websites in the world. [2:10] So, Why did we want Seth on the podcast? Why do we believe that lawyers need to hear Seth’s message? Peter: [2:16] It’s no secret that we believe that if we’re going to change the legal industry, it’s going to take all of us. We need every voice and every insight, both inside and outside of law. [2:26] In thinking about outsiders, we started thinking about people who gave us a gift, people who have influenced us and people who we believe NewLaw needs to hear from. Seth’s name immediately came to mind. Natalie: [2:36] So, without further ado, there is our interview with Seth. Peter: [2:45] What’s happening right now in the legal industry is we’re seeing a bit of a change. We’re seeing a shift in terms of how lawyers want to deliver legal services, as well as how clients want to receive legal services, but what we’re not seeing is we’re not seeing a lot of actual change happening, and I think a lot of that has to do with fear. Can you talk a little bit about fear and the resistance to change? [3:25] and, they are two different ways of looking at the world. If you make cars, then, if cars shift to cars that don’t have wheels or shift to electric cars, that’s fine because you’re still making cars. [3:38] On the other hand, if you define yourself as being in the bolt screwing business, change represents a significant threat. That carries with it a lot of fear. We’re organized deep within our culture and our DNA to fear that sort of change. [3:53] So, when I think about most people in the profession that we call law, most of them signed up not to do what 500 years of jurisprudence has been about, but to be a “Lawyer”. To have a certain lifestyle in a certain kind of building for a certain kind of clients doing a certain kind of work. [4:14] And, I’m not that interested in that. I’m really interested in going up two or three levels and saying, “What is it even for?” What it’s for is to make change happen. That a good day as a lawyer is moving things in the direction of justice. [4:33] Whether that’s civil litigation justice or the justice of getting a homeless person what they’re entitled to, but that change, making change happen is something that lawyers are more trained to do and less likely to do than any other profession I can think about. [4:53] The shift that’s going on in this profession is actually an amazingly positive thing, because it permits people who care to make more change happen, but if you are in favour of the status quo and are counting your billable hours, and are hoping to make partner, and are on this track of doing slightly above average work for slightly above average clients again, again, and again for more hours than anyone else thinks is rational, then you’re in for a world of hurt. Peter: [5:25] I speak to a lot of these lawyers and I hear people that say that they’re interested in change, but the reality is that they’re quite comfortable. In those types of circumstances, do you see change happening or what would be the real impetus for a wide‑spread change? Seth: [5:43] Well the thing about cultural change is it happens whether you want it to or not. When I helped invent commercial email 25 years ago, I went to the Direct Marketing Association, and they hated the idea of email marketing so much until they became spammers that they threw me out. I wasn’t welcomed back for years and years. [6:04] Because if you are really good at the business of buying stamps and doing big mailings and everything else, email represented what felt like an existential threat. They said, “Maybe if we don’t actively participate in it, it will go away.” It doesn’t work that way. [6:20] The same thing happened to travel agents. When Sabre moved online, travel agents said, “We’re just going to pretend that didn’t happen and maybe it will go away.” The same thing happened to newspapers. When Craigslist wiped out 110 percent of their profit by eliminating the classifieds, newspapers pretended it didn’t exist. [6:42] So the same thing is going to happen to the legal profession. I remember when I incorporated my first company, we went to a fairly well‑known firm. They charged us almost $10,000 to print out a file that was on their hard drive. That will never happen again, because the hard drive’s in the cloud now. [7:03] And if you think about almost everyone who’s reaching out to a lawyer would rather spend less time, spend less money, and get that over with. Lawyers can’t thrive in their old scarcity model if the culture is shifting to a model of abundance – abundant information, abundant access, abundant connection. [7:24] So, I’m not saying lawyers should be in favour of this. I think they should be, but that’s not my argument. My argument is they should be aware of it, and since it’s happening, now what are you going to do? Because you’re going to practice for another 40, or 60, or 20 years and fighting a rearguard action, hoping to get back to the days of powdered wigs, it’s just not going to work for you. Peter: [7:46] So I think most people accept that change is going to happen and they’re aware of it, but where a lot of lawyers are right now is they see that change happening in a much distant future. [7:58] I almost feel like there’s resistance to change because people are thinking, “I don’t need to change now. It’s too early,” and there might be some sort of almost negative repercussion for changing too early. Seth: [8:11] Yeah, and I’m going to give the skeptics credit, because they don’t merely fight change because it would hurt them. They fight change because it will actually be inferior to what is now. [8:22] Vinyl records got replaced by CDs which by many people’s measure were inferior and those got replaced by MP3s, which by every measure of audio quality are inferior. But we always destroy the perfect before we enable the impossible. [8:40] The impossible is every person with a Smartphone in the world has access to every song ever recorded every time they want for free, and the quality will come back up. The point is it is probably not in your or your client’s best interest, in the short run, for you to destroy the perfect, but it’s going to be necessary to enable the impossible. [9:02] So I’ll give you a simple, legal example. Years ago, I ran a website called Squidoo that let anybody build a page about anything they wanted to. We had 300,000 people building pages that were seen by many millions of people every month. I got a claim letter from the lawyers for Abbott and Costello. [9:45] Well the irony, of course is that the page someone had built, all it did was link to buying a legal copy of Who’s on First from Amazon, which would make a profit for the heirs, but they used the computer system which they had which searched for Abbott and Costello, Who’s on First, and every time it found a match, sent them a claim letter to take it down. [10:07] Because in the old model of scarcity, that’s exactly the right thing to do, particularly if you get paid 300 bucks every time you do it, but in the new model of abundance, what they’ve discovered is that almost no one under 40 has ever heard of Who’s on First? Therefore, they’re irrelevant. Therefore, no one is going to pay them anything, because it’s not famous anymore. [10:30] So a new copyright regime is in place right now, where famousness is more important than royalties. That requires a different way to think if you are the lawyer in the middle of that conversation. I could repeat this for almost every field I can think of, whether it’s litigation, or other forms of civil stuff. [11:07] Remember, this is a profession that fought hard against billboards for a really long time. How do we enter a post‑billboard era, again of unlimited scarcity? All I have to type is, “criminal defense, Yonkers, New York,” and I’ll find how many people who show up in the search results. That’s not a strategy for growing a practice. [11:28] All of which comes back to the same thesis, which is we are leaving an industrial economy, where lawyers were the highest paid cog in the system, and entering a connection economy, where the person who is valued the most is the person who is most connected, not the person who bills the most hours. Natalie: [11:47] And How do you think that works in terms of if I’m a lawyer within a larger law firm, and I try and build myself as a connected economy, and to have a non‑generic profile? Am I better off building myself individually, or should I be building the firm? Seth: [12:06] What’s the purpose of the firm? This is a scholarly paper that was written in early 1960s or 50s. Why do corporations even exist? [12:15] It turned out we needed corporations before because having everyone lined up around the steam engine, that turned the piston, that turned the wheel that let you have the tools shared, was more efficient than having everyone be separated. [12:32] The same thing is true for a law firm, that big law firms aren’t the original way lawyers practiced. They’re fairly recent. They exist for a couple of reasons, but the biggest reason is big law firms make it easier for big companies to hire lawyers. That’s their main value add. [12:51] If we are entering an economy where that value add isn’t nearly as important as consensual, ongoing trust relationships between people who can work together when it’s convenient, which is, by the way, the way the movie industry works, then betting your future on being part of a big firm is certainly your choice, but it might not be the right one. [13:16] That’s a preamble to my answer. I keep doing these preambles because if the lawyer mindset keeps asking the wrong questions, then the lawyer mindset is going to keep getting frustrated at the answers. What we need to do before we can get at the answers is think hard about the questions. [13:36] Then, the question is, “Do I promote myself, or do I promote the firm?” Well, what matters to the client? That’s what’s interesting. What’s in it for the client to know that you’re part of the firm? [13:50] If I have a First Amendment case, do I want Floyd Abrams’ firm, or do I want Floyd Abrams? I don’t know if he’s still around. I’m picking an example from the old days. [14:00] I want Floyd Abrams, because he is the one and only. In a world where the one and only doesn’t cost a lot more than some schmo that works for that lawyer, what we’ve discovered is, in a cult of personality, more and more people want the real thing. If you can become the real thing, you’re never going to need to look for work, or good clients, or good projects ever again. [14:26] Whereas if you’re just affiliated with someone who is the real thing, she has all the power, and she’ll replace you the minute you get uppity, or the minute there’s someone cheaper and faster than you. [14:39] At the heart of serving a client is our willingness to personally connect, either in small groups or individually, and say, “We are the people who do this work,” without apology. “We’re not going to send you to the tax partner at another office we’ve never even met. [15:00] “What’s that about? Everything we do is going to be because you trust us,” and so like many things on the Internet, it’s back to the old days. It’s back to my grandpa Yezlawnwand. [15:10] If Yezzo took on your case, every single person who worked on that case is someone Yezzo could recommend to his best friend. You knew that he was behind it. That’s old school law, and that’s what we’re getting back to because big isn’t as good as it used to be. Peter: [15:30] Is Big Law interested in having its lawyers follow that model and selling in that way? Seth: [15:36] It depends. That depends on how enlightened and motivated are the people who run the thing. I did a talk for the guys at McCarthy Tétrault a year‑and‑a‑half ago. The thing that was most notable was how extraordinary the management at the firm was. [16:24] I am bullish that firms like that have a great future, but I’ve also seen firms – like Cadwalader – that fought super hard to maintain the status quo, which leads to all this politics internally, which leads to paralysis, which leads to people with books of business going other places, which leads to the whole thing falling apart. [16:45] The outside world is changing whether you want it to or not. If you’re going to insist it not change, then your firm is going to be under enormous pressure. Natalie: [16:53] How can lawyers who want to make a ruckus. How do they know where to aim? What should they try and emulate? Seth: [17:00] Okay, so here is the paradox of law school. Law school says take really good notes, and then at the end of every semester, say back what we taught you. Then they have this bar exam thing, which is even more of the same. [17:18] None of which teaches you how to lead, how to connect, and how to solve interesting problems that have never been solved before. Those are the three things that make a law practice juicy. [17:32] So the shift needs to be understanding that you can hire a drone who’s read more law books than you any time you want. That you can hire somebody to read depositions more carefully than you any time you want, but your greatest work, the work you’re going to remember three years, five years, ten years from now, that your clients will thank you for, is leadership, connection, and solving interesting problems. [18:00] If I asked you to open your billings book for the 2,300 hours you billed last year and asked, “How many hours of the 2,300 did you spend leading, connecting, or solving interesting problems”? My guess is it’s less than 20, and that’s the shift. Peter: [18:19] Do you think that there’s any risk that these lawyers would be seen as something different from the norm, but in a negative way? That you would almost be viewed as too different and not safe in hiring a lawyer or a law firm. Seth: [18:33] I don’t think there’s any risk at all. It’s certain that that will happen. It’s 100 percent certain that if you do these things somebody who wants to choose a completely deniable risk‑free center‑of‑the‑road choice will not choose you. They’re not going to choose you anyway, so what do you have to lose? Seth: [19:10] Find out what people believe. Find out what people are afraid of. Find out what people’s problems are. Find out what they desire. Don’t ask them what to make. Don’t ask them what the next invention should be. Don’t ask them what you want to do next, because they’ll give you the wrong answer. [19:31] Our job is to work with personas and dreams and tribes and communities to bring them something that they wanted all along but didn’t realize it. [19:53] Basically, his argument is that in every population there is a standard deviation of people that are early adopters that are geeks or nerds who are neophiliacs who seek change. Then the mass group, 80 or 90 percent, are in the middle. They want something that works that everyone else is doing. This is people like us do things like this. [20:16] Then there’s a small group just like the first group, they’re the laggards. They still have a 12 flashing on their VCR. They don’t use Lexus Nexus because they’d rather use a book. They’re the last part of the curve. [20:30] What we see, whether we’re trying to sell cellphones or a new kind of bowling ball, is it always gets adopted by a small portion of the population first and then other people come along when they come along for certain reasons. We can see this in law schools. Some law schools have deans that are neophiliacs that are pushing a new way of thinking and some law schools aren’t going to change anything for a really long time. Natalie: [20:55] How can somebody who is currently a cog in a wheel making good money and not feeling the need to change, how can they develop the confidence and I guess the vision to step outside of that and move to the edge and put themselves at risk? Seth: [21:13] So there’s so much juiciness in your question and I’m really glad you asked it. Here we go. Many lawyers have a narrative of the work they do, that they’re somehow engineers in their pursuit of truth. That they work in facts, cold hard facts. This is nonsense, because guess what? Half of all the situations where a lawyer is in a dispute, she’s on the wrong side. Half the time the facts are not on your side. Half the time the truth is not on your side. [21:45] That’s what it means to have an adversarial system of justice. You don’t actually work in truth and fact. What you actually do is work in stories and belief and on the fringes of magic. You’re not building a bridge with tensile strength and other things that can be tested in a lab. [22:07] So what you’re really saying is most lawyers who have entered the... I’m going to use the word “Corporate” in quotation marks‑legal system have seduced themselves into thinking that they can give up truly independent thought and become obedient white collar workers and be really well rewarded in terms of money and status for this work that they do. That it’s not that risky. What I am saying is the least risky thing you can do is walk away from that. [22:44] And the riskiest thing you can do is keep doing it, because when society changes, it turns out that leaping is the unrisky thing to do. That this leap to being trusted and connected and on the fringe and solving interesting problems is completely safe compared to handing over your future to some 64‑year‑old who’s been doing law the same way for 42 years because guess what? He doesn’t care about you. He’s just waiting to retire. Peter: [23:17] But they’ve gained something too by being that cog in the wheel. That’s what’s holding them, right? It’s that golden handcuffs issue. It’s that they have a house. They have a wife. They have children. They have all these things that are tying them. Seth: [23:27] Ah! I was with you until just now. They think they have all these things. They think that if they spend three hours a week intellectually engaged with something that doesn’t increase their actual billable hours they will be fired, their wife will leave them, they will lose custody of their children, and they will be ashamed for the rest of their life. [23:45] They have equated two things that aren’t equal in any way. They’re unrelated completely. They’ve catastrophized any movement toward change because they’re in this hyper-competitive mindset that says it’s the last two billable hours per week that are the secret of their success. That’s utter nonsense. Peter: [24:13] Sorry, Pippi, did something change in the audio? Seth: [24:16] What changed is the fire department in Hastings on Hudson, New York, which we love, they’re all volunteers and don’t use cellphones or beepers. In fact, when there’s a fire they play a really loud noise over and over. Peter: [24:33] That’s so effective though. Seth: [24:36] I love it because it’s just a reminder that technology has not changed all of us yet. Peter: [24:42] Actually, I’d like to take that point and ask you about spouses and partners. You’ve been on this journey for a long time and you’ve talked before about failures that you’ve had. You making your art impacts the people around you as well. Can you talk about that a little bit? Seth: [24:57] Yeah, I think that’s a juicy question. Every once in a while you read about somebody who died climbing Mount Kilimanjaro or Mount Everest without oxygen and they had a two‑year‑old. You slap your head and you go, “What an idiot.” I actually think they are aren’t idiots because there is room in our culture and our lives for the foolhardy adventurer who’s going way out into the fringe. [25:26] I’m not sure you should do that if you’ve got a two‑year‑old. I’m not asking, arguing, cajoling anybody who’s listening to this to quit your job and try to install a US style legal system in Mali. What I’m saying is that there’s a huge difference between the actual risk of climbing Mount Everest in the winter without oxygen, and the perceived risk of going for a half‑hour walk after lunch. Natalie: [25:58] What’s the next best thing that somebody could do to change that narrative and realize that the fear they’re experiencing is not real? Seth: [26:06] So, fear has a useful function in our lives. For example, 10,000 years ago if you offended the chief, he threw you out of the village and a saber‑toothed tiger would eat you. We learned not to offend the chief. People who did offend the chief didn’t have grandchildren and their genes were not passed on. [26:26] So wired deep within us is stuff that keeps us from getting eaten by saber‑toothed tigers. What it means to be a professional is to figure out how to put that feeling aside. Can’t make it go away, but put it aside while you do your work. We are wired to not want to cut somebody open and look at their guts, but surgeons do it every day and they do it because it’s their job. So, here’s the deal. [26:54] There’s this cadre of lawyers – I don’t know, 1 million of them – who have been paid incredibly well given that they don’t have to work in inclement weather. They don’t have to use a shovel. Their life is not at risk. They get paid a ton. Now you need to earn it. You need to earn it by understanding that we’re no longer paying you to put in the hours, because we can outsource those cheaper than you could do them. [27:22] What we’re paying you to do is something interesting. The way you become professional at it is you start small. There was a non‑profit right down the street from your office that would eagerly have you be their general counsel and advisor. To tell them not the safe path, but the riskiest path that they can tolerate. That act on your part is going to teach you that the fear isn’t fatal. Peter: [27:52] One of the things that I see from our practice is recruiting people or having team members join. There’s two kind of barriers to this. The first one is the traditional mindset that we’ve been talking about and trying to have people find their own path and realize that the path their on is not the path maybe that they should be on. [28:09] The other thing I see is people who are like‑minded. What I see from some of them is I see they believe they need to do this as individuals as opposed to part of a team. What I’ve learned over the course of my career in working with great people is that we’re all so much stronger when you find like‑minded people and they’re bound together. Seth: [28:32] It’s clear that you’re digging deep and doing this generous work of not just elevating your approach, but trying to create community around it. All the way back to when Jones Day was multiplying like rabbits, there’s been a tension because partners haven’t been partners in a long time. What it used to mean to be a partner is you were in it together. That feeling of people having your back and understanding your story and where you needed to go is priceless. It’s rare and it’s priceless. [29:09] If you can be the kind of leader that can find like‑minded folks who are the kind of intellectual renegades we’ve been talking about and give them connection and support, that’s such a contribution. It’s needed. [29:21] Most people who are contributors have a hard time organizing other contributors. We’ve seen through the history of our culture that if you become one of those people, enormous value is created. Enormous value is created when you mentor and connect and create these opportunities for people. [29:43] I’m thrilled that you’re doing that. I don’t think it’s recursive in the sense that everyone you do it with will then do it for other people. Most people have got enough trouble keeping their own stuff straight, but if you can be one of those people who can do that, you’re going to be remembered for a long time. Peter: [30:00 It requires both parties to come with this idea that we’re going to do this together. I find that to be so rare. People are so quick to not trust the other. Seth: [30:10] The guy who started Startup Weekend has created hundreds of thousands of job. Startup Weekend is a great phenomenon. You should look it up. Most of the people who come to Startup Weekend come with their own agenda, but just like Jimmy Wales who started Wikipedia, the enabler of the community doesn’t get as much credit as he or she deserves, but it’s essential. [30:33] What will happen is friendships will start at Startup Weekend or friendships will happen among the 5,000 key people at Wikipedia and Jimmy Wales doesn’t get invited to the wedding, but the wedding happened because of him. [30:48] What we have the opportunity to do now is be the impresario, or the organizer, or the coordinator. That will create this value. In general of the people who do this are amazingly humble, but the people they do it for tend to be fairly self‑centered because they’re human and rarely show the gratitude or the humility in response. I don’t think that should stop you from doing it. Peter: [31:17] It’s funny, I’ve sat is so many meetings and people, they look at us and they don’t understand some of the things that we’re doing. They’re trying to find why we’re doing this. And the only answer that we’ve come up with is it’s because this is who we are and this is what we believe is the right thing to do and this is the right way to practice. Is there any other answer other than that? [31:58] I like the first answer better because it’s more pure and it’s easier to keep track of. You do it because it needs to be done. You do it because it’s who you are. [32:06] The fascinating paradox is that Clarence Darrow, Williams Jennings Bryan, even David Boies, these people become super successful – and in David’s case, probably – wealthy attorneys on the basis of the work they do that’s art. Meaning that when you take on the Scopes monkey trial or you take on a Clinton v. Gore, you’re not doing that for the money. You’re doing it because it’s an art project. You’re doing it because it needs to be done. [32:40] My argument is in an economy based on connection, that’s what we notice. The people who do things that need to be done. The people who do things because they’re right. Peter: [33:00] Sorry, say that again. Natalie: [33:18] The community is wonderful. We were talking recently to Selena Lucien. She is working on a project called “Small Claims Wizard.” We talked about you and she was so excited. She even told us that it was your birthday yesterday, so happy birthday for yesterday. Peter: [33:33] That’s been the best thing about this, and I’m sure you’ve experienced this tenfold. It’s really amazing once you start engaging in this way how you start finding like‑minded people and the momentum that that builds. Seth: [33:45] The other thing that’s worth saying is none of us are going to live forever and all of us have a chance. That chance comes with obligation that we won the birthday lottery. We were born in the right place at the right time in the right country with the right resources. One of our obligations is to make our community better. We get an enormous number of privileges. It seems to me that those things come with obligations. Peter: [34:15] You are one of the few people who talk about the long road and going through the dips, but I will say on many days the short term is attractive. Seth: [34:25] It’s so ironic because you guys went to school that was no fun for three years that cost almost a quarter of a million dollars. Ironic because for years and years you toiled filling out paperwork no one would ever see so that you could get to this other thing. That’s long term. [34:44] Then suddenly it’s all about, “Well, is this client going to pay me more this week? Or should I go that thing instead?” Where did that happen? The longer the term, the happier everyone involved is. [34:58] The biggest challenge is in our culture. The things that lead to wars and famines and everything else is short term thinking. As soon as we switched to long-term thinking, things get better. The longer the term, the better things get over and over and over again. Peter: [35:14] It’s interesting because you talk a lot about in your book getting rid of expectations, not having expectations. Can you marry that thought with this recommendation to be a long-term thinker, to act long term? Seth: [35:27] Well on first class from New York to LA, the nuts aren’t warm anymore. They just give you a bowl of cold nuts. There are people who are upset by this because their expectation was that they would get warm nuts. It doesn’t matter, as Louis C.K. has pointed out, that you’re flying in a tube through space at nearly the speed of sound for $900 to get to a completely different part of the world safely. All they care about is that their expectation of the nuts doesn’t match what actually happened. [36:03] What it means to make art is to suspend your expectation because you cannot simultaneously do something that might not work, and also expect that it will. That paradox will force you to not do art, will force you to not do something worth doing, will force you to be selfish in short-term thinking, because you get hooked on meeting expectation and not engaging in the disappointment that’s the alternative. [36:36] My argument is if you are lucky enough to be where the lawyers who are listening to this are, maybe for once get out of the habit of expecting the $100,000 bonus or expecting that this person will like what you did or expecting. Just let the expectation go for a while and do instead what’s interesting, what’s worthy, what’s right. If we can practice that for a few minutes a day, it ends up making everybody involved happier. Peter: [37:10] That’s so hard to do. What I’m thinking about often is when you’re trying to make change, how can you care about something so deeply and at the same time release all expectations? Seth: [37:21] Because, this is critical. We have to get rid of this concept of the jury. You can have enormous expectation for the work, for the quality, for the sweat, for the process, for the posture. What you can’t do is will somebody else to like what you did. You can’t will somebody else to applaud. That’s the distinction. We have to let go of what somebody else is going to do because you can’t control it. Peter: [37:55] The last question I’ll ask you, and I was really interesting in this as well. Can you talk a little bit about the separation between the artist and his work? Seth: [38:05] You are not your work. Meaning, when someone writes a one‑star review on Amazon, they’re not giving me a one‑star review. They’re telling themselves and the world a story about their interaction with something I made. They’re mismatched between their expectations and the reality of what occurred. [38:25] That’s not me. That is their response to a thing I did. You have to be willing to let that go, because otherwise all the evolutionary things that get you to hide will keep you from doing your best possible work. Peter: [38:40] That applies even in a world where your reputation is everything. Seth: [38:46] Back to the paradox where we started. The only way in a connection economy you get a reputation is by making art. You want me on a podcast because I have way more one‑star reviews than they do. Peter: [39:00] Is there something else that you want to communicate to lawyers or people going through this journey? Seth: [39:05] Well, it’s not a pitch because I don’t really keep track of whether people buy books I write or not, but I wrote a book for lawyers called ”Your Turn.” It’s at yourturn.link. The idea behind the book is for you and 10 of your partners to read it at the same time and for it to get under your skin. I could talk about this stuff all day, but instead I wrote it down. Peter: [39:25] It’s Your Turn has been highly influential here. We give it to everybody who I think could use it or is receptive to that message. It’s part of our onboarding process now. Natalie: [39:35] Everybody reads it. Seth: [39:36] Wow, that’s great to hear. Peter: [39:40] Anything else you want to communicate? Seth: [39:53] The work matters. Those are three words I hope you will write them down. You are not doing something trivial. Your work matters. I just want you to make it matter more. Peter: [39:50] Thank you for this, Seth. We can’t express our gratitude enough. Seth: [39:55] You guys are great. It’s a pleasure. See you. Peter: [40:00] Do you want to talk about what happened after we recorded this episode? First of all, I want to apologize to everybody, the people in this room as well as the people who listened to that podcast. I felt a little stunned throughout the podcast. Natalie: [40:15] It’s really hard to take in what he’s saying in real time. Peter: [40:20] There’s two things. First of all because we’re fans, so that was different. It’s somebody who has been interviewed by people who actually know how to interview people in the past and then there’s us. That’s going on in the background. In addition to what you just said, you have to process because it is so different than anything else we’ve heard of before and many of the things we’ve thought about before. Natalie: [40:45] It’s so different, but it’s so simple. That’s always what strikes me. Even the first time we read through his book. On the first read you’ll get a different message to what you read on the second time around. Peter: [40:55] A step further is that I’ve read his latest book multiple times. I listened to every podcast I think he’s been on leading up to our podcast. I’ve thought deeply about what we’re doing and what’s happening in the legal industry. It was such a departure from all of that. In any event, if you could hear that in the interview, I apologize for that. [41:17] Two views of the world. We are either somebody who screws bolt number seven on the left rear wheel of a Volvo or we are somebody who makes cars. If we look at ourselves as the bolt screwer, change is a threat. If we don’t, it’s not. Natalie: [41:36] It’s even more than that though because he’s sort of linking the idea of fear and resistance to change and everything to, ”Why are you a lawyer. If you’re here to make money, change is a problem. If you’re here to do what lawyers are meant to do,” and as he said, move the world closer to justice, make that change‑then change in the sense of the change in the legal industry that’s coming isn’t anything to be afraid of. It’s something to welcome. Peter: [42:03] I don’t think a lot of people have thought about ”Am I a bolt screwer or am I somebody who builds cars?” Because in this context, bolt screwing can look really good. It looks like a big office downtown. It has shiny suits. You can dress it up really, really nicely. We all do this to some extent. We all deceive ourselves and create an image of ourselves that we want. It’s really hard to have that type of realization in law specifically. Natalie: [42:32] Bolt screwing to you is referring to the type of work that you’re doing? Peter: [42:35] Yes. It’s unthinking, unoriginal work. It’s assembly line work. Natalie: [42:42] Sending those cease and desist letters he was talking about. Peter: [42:45] Yes, absolutely. It’s what everybody’s talking about when we talk about AI and automation and what’s happening in law. Everybody gets really anxious about that type of stuff. Whatever can be replaced is the bolt screwing work. If you earn a living doing that type of work, that’s why this change is a threat. We should not be holding onto that type of work. We should not be aspiring to that type of work. The thought that floored me, the idea that we need to destroy the perfect to enable the impossible, I’ve never really thought of that before. Have you? Peter: [43:26] When he says, “Destroying the perfect in law,” what that meant to me was it’s providing the highest level of client service and legal work to the client. That interim period requires you to destroy the highest quality, highest level of client service in order to get to the stage that I guess we’re going into as far as Seth kind of described, to get to whatever that next level is. Which is more individualistic, personal, high client service at high caliber legal work. Natalie: [44:00] I see it that way. What I don’t get is why it’s perfect right now when 80 or 90 percent of people can’t get a lawyer. Natalie: [44:30] Yeah, I think that’s fair. Peter: [44:32] Now it’s that path to find the impossible. Natalie: [44:36] I really liked the perception of risk part he did where he said that you think if you spend an extra two hours doing something non‑billable, your wife will leave you, you’ll lose custody of your children, you’ll get fired, and be ashamed for the rest of your life. Peter: [44:49] This idea if you start a podcast, your firm is going to fall apart. It’s incredible. If you take two hours out of your afternoon and attend Mitch Kowalski’s legal innovators roundtable, you’re not going to bill two more hours, which means your firm is going to fall apart. Peter: [45:10] Yeah. There’s a lot of things that staggered me in this podcast. Most lawyers who have entered into big law have seduced themselves into thinking that if they give up truly independent thought and you put bolts on and you do what you’re told, that that is not risky. What he says is that’s the riskiest thing you could ever do. Natalie: [45:27] He also said it depends on who the leaders are. Because he pointed out if you’re following the 64‑year‑old who’s just waiting to retire, yeah, you’re in trouble. But if you’re following really smart management at McCarthy’s or something and if your firm is aiming at the right place in the future, then I don’t think you have as much of an issue. Peter: [45:45] Yeah, I agree with that. The only thing I would respond to that is any time you’re following, you’ve lost. Natalie: [45:50] I don’t agree with that. Peter: [45:52] Let me explain that. Counter Tax Lawyers is my law firm, technically. Natalie: [45:58] And I follow. Peter: [laughs] [46:00] See, that’s not what I think, though. We’ve banded together and created an environment in which no one has to follow. Natalie: [46:05] People do have to follow. I think the second the path of the firm goes down a road I don’t want to go down, I will stop following. I’ve not abandoned independent thought. I’m very aware of what I’m doing. I think that in order to get somewhere, you need to have a spearhead, have a leader, and you need followers. Peter: [46:25] Are you threatening me? Peter: [laughs] [46:30] As soon as the firm goes down a path I don’t like, I’m gone. Natalie: [46:32] It’s true though. I really hope that every lawyer thinks that daily when they walk into their office. Peter: [46:40] Actually, this ties wonderfully into this next point which is partners have not been partners in a long time. What it used to mean to be a partner is people who are all in it together. In a world in which everybody is so obsessed with partnership and in a world that has so few partners, that’s an important thought. People always ask us – people who interview here or people just entering the profession or our hires – can I be a partner? Natalie: [47:04] What do you think they’re really asking? Are they asking about control or they asking about money? Peter: [47:15] No. No. No. It’s a perception that I need my voice to be heard and I need to make sure that it’s heard. I need to make sure that it influences something. Natalie: [47:36] It’s more of a partnership than an actual partnership. Peter: [47:40] Yeah. It’s the greatest partnership ever and I hold all the shares. That is such an odd concept. I think that people who view partnerships or who define partnerships as they’re defined now in law find that difficult to understand that. Natalie: [47:53] They’re hung up on the legal definition of a partnership. If you are valuable, you will be heard no matter whether you’re a partner or not. I think that’s the real meaning of a partnership. Peter: [48:42] That’s what I hope this podcast did. Natalie: [48:49] For this episode’s show notes and transcript, please visit our website at buildingnewlaw.ca. We’d love to hear from you. If you have any feedback, feel free to send an email to info@buildingnewlaw.ca or come and find us on Twitter @buildingnewlaw. [49:04] Don’t forget to subscribe on iTunes, our website, or wherever else you get your podcasts. This has been ”Building New Law.” Join us again for another episode exploring the approaches, processes, and tools that are redefining how we practice law. Sponsor: [49:22] Thanks for listening to the Building New Law podcast brought to you by Counter Tax Lawyers. To learn more about Counter, go to countertax.ca. Lawyers that have completed the S01E10 BNL CPD can claim a 60 minute Professionalism CPD credit. To access the S01E10 verification examination click this link.